Operate the air-conditioning system with the engine running. To prevent the battery from being discharged, do not leave the fan control dial on for a long period of time with the ignition switched ON when the engine is not running. (With i-stop) The airfl ow amount may decrease slightly while the i-stop function is operating. Clear all obstructions such as leaves, snow and ice from the bonnet and the air inlet in the cowl grille to improve the system effi ciency. Use the air-conditioning system to defog the windows and dehumidify the air. Use the outside air mode for ventilation or windscreen defrosting. If the vehicle has been parked in direct sunlight during hot weather, open the windows to let warm air escape, then run the air-conditioning system. Run the air conditioner about 10 minutes at least once a month to keep internal parts lubricated. Have the air conditioner checked before the weather gets hot. Lack of refrigerant may make the air conditioner less effi cient. 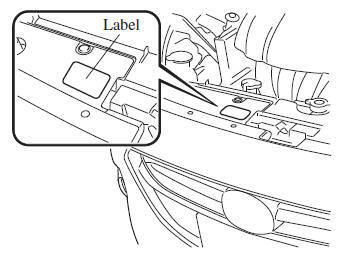 The refrigerant specifi cations are indicated on a label attached to the inside of the engine compartment. Check the label before refi lling the refrigerant. If the wrong type of refrigerant is used, it could result in a serious malfunction of the air conditioner. For details, consult an expert repairer, we recommend an Authorised Mazda Repairer.